Tonight I simply did not have it in me to make anything for dinner but something had to be made. I pulled out my handy recipe book and began sifting through until I found something to make with the chicken I had taken out earlier in the day to defrost. I found this recipe from Campbell's soup, figured it was quick and went for it. This was a big hit with the family and I'm quite happy I decided to give it a try. I did add in about 1 tsp onion powder and 1 tsp garlic powder to add more flavor. Another substitution I made was to use spaghetti noodles for the linguine and it was still perfect. Prepare the spaghetti according to the package directions. Add the broccoli during the last 4 minutes of the cooking time. Make sure you drain the mixture well. 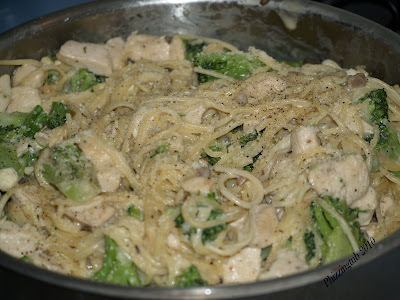 Stir the soup, milk, cheese, black pepper, garlic powder, onion powder and spaghetti mixture in the skillet. Cook until the mixture is hot and bubbling, stirring occasionally. Serve with additional Parmesan cheese. Per Serving: 406 Calories; 12g Fat (26.0% calories from fat); 38g Protein; 36g Carbohydrate; 3g Dietary Fiber; 90mg Cholesterol; 351mg Sodium. Exchanges: 2 Grain(Starch); 4 Lean Meat; 1/2 Vegetable; 0 Non-Fat Milk; 1 1/2 Fat.